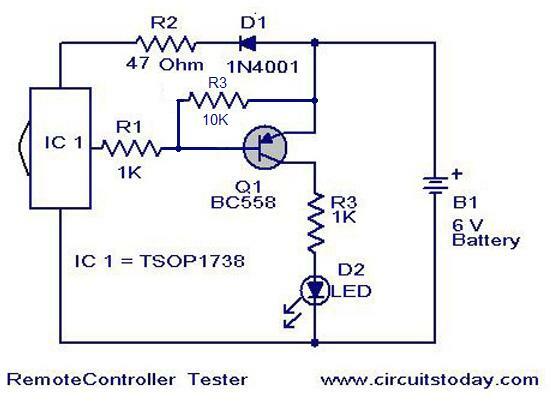 This is a simple remote controller tester circuitÂ based on infrared sensor IC TSOP 1738. When the IR waves fall on the sensor it output changes to low state. This makes the transistor Q1 (BC558) ON and LED will blink according to the code contained in the signal. So for the press of each button the LED blinks in different ways. This is a good indication of the working of remote. The diode D1 drops 0.7 V to give the IC ~ 5V supply from the available 6V. R2 is a current limiting resistance. The transistor BC558 can also be replaced with others like BC158, BC177, S8550, 2N2905. If you find the LED glowing all the time even if you cover the IR sensor it may be a problem with the IC.Â This ICs output with no signal will be high and with signal it will become low. May be the quiescent current through IC1 itself is biasing Q1 may be your specimen if of quite high gain. You can try by shifting the emitter of Q1 to R2 IC1 junction, which may solve your problem. You can modify the remote control tester circuit to connect aÂ piezo speaker between the transistor collector and the negative terminal for sound indication. Use a 6V battery to power up the circuit. This circuit can be used to test remotes operating in the 38Khz carrier frequency.Almost all remotes fall into this category so no problem. The Remote control tester circuit uses the IC TSOP1738 for its working.Â This is an IR remote control receiver module which is embedded with a PN diode and a pre-amplifier to form one pack. This IC produces an active LOW state output and provides a HIGH +5 Volt at OFF state. That is, when IR radiations with a frequency of 38KHz (sensitive frequency of TSOP1738) are received by the IC, its output will be LOW. All the unwanted rays coming from sunlight, high wattage bulbs and so on could produce an undesired output for the sensor. This can be avoided by using a Band Pass Filter (BPF), an integrator circuit and an automatic gain control. The pulses that are received from the IR Transmitter are amplified using a control module inside the IC. The PIN diode produces a signal corresponding to the signal it receives. The AGC adjusts the gain to a certain level according to the signal it receives from the PIN diode. The AGC sends its output to a BPF and filters unwanted frequency. These frequencies are then passed on to a demodulator and then to a transistor. The collector output of the transistor is obtained at Pin 3 of the IC. if I connect toy motor (3-6V DC motor,toy motor) instead of LED-D2, it can work? can we use 9v battery instead of 6v battery…pls help. Yes, but you must use a 5V stabilizer (78L05, for example) to the IR sensor (to replace D1, R2) and recalculate R3 for optimum power LED (D2). It can connect a piezo speaker between the transistor collector and the negative terminal to take and sound indication. pse send me full description with components wise and circuit diagram of remote controlled car with wireless camera at a distance 50-100 mtrs. give me power electronics circuit diagram in pcb and bradboard imm. Hi Rahul BC548 is NPN transistor. you have to use PNP transistor like BC558, 158, 177 or S8550 2N2905 etc. but i need clear clarification about this tsop i read in online but not clear can u help me. what is the range of this circuit…????? I am still hed up at Rajasthan. I am expected at Chennai by this month end. I will positively try and give a feed back. Sorry for the delay. quite useful stuff to check all remotes at home. Dear seetharaman did you tried the circuit at your lab, can you tell me the problem in the circuit – Krishnamurthy. dear sri krishnamurthy i am back at my lab. in a day or two i will try a design and come back to you. Dear Krishnamurthy you can try the IR transmitter used in the following site. two IR LEDs are used with NE555 and 9 volt supply. most of the circuits of this blog is working ok. i will be back to my lab by 2nd april i will try and come back to you on the IR transmitter. Idont know how to paste the circuit in this submit column. I can describe circuit I used. I used 555 timer as austable MV to oscilate at 38Khz. The out put is fed to a 2N3019 transister basae via 1K res. Emiter connected to ground. The IR diode is connected to the collector through a 67 Ohm resister. The supply volt is 6V. I measured the frequecy at the collector and confirmed the signal is available. There is no other way to check transmission. But IR detecter is not detecting. Hi Seetharaman Thank you for your help. Just before getting your comment I tried connecting a 4.7K between base and emitter of Q1. The problam was solved! It detected T.V remote signals. But alas it could not detect IR transmitter I have built. Just how many IR diodes I have to use to get the receiver work? I used Just one. Hi Krishnamurthy, This ICs out with no signal will be high and with signal it will become low. May be the quiescent current through IC1 it self is biasing Q1 may be your specimen if of quite high gain. Can you try by shifting the emitter of Q1 to R2 IC1 junction, which may solve your problem. Since I am away from my lab, could not try and give you a feedback. Iassembled this circuit. But the LED glows constantly even if i compltely cover the IR sensor. What could be the problem? Please help me. i required the circuit which can turn on/off two or more devices using normal remote. Once again, sometimes the most obvious solutions are staring you in the face. You are correct, if you turn your cell phone camera on and face it directly into the infra red LED’s, you will see the LED’s shining white. ***WARNING*** DO NOT LOOK DIRECTLY INTO THE INFRA RED LED’S. Prolonged exposure can harm. Please note that the purpose of this website is education and why use something mass produced if you can build something yourself and learn something in the process. the circuits u r providing is wondrful…………. ithink it will be more if you explaian the working with each component in it. I am regularly visitor of your site.i want to make a circuit.the application of this circuit is when we speak any word in this manner led will on.this project will based on the led.ex.i say “technology”in this manner led will on and i saw this word on display. so,give me circuit for this application.and also give me program of this circuit. it is a wonderful circuit. i need a mobile locator circuit with small display could u give me? that’s a good idea.mobile cameras can sense IR and its of course the best idea. i need remot control circuit !!! this article is very good.but can you provide the toturial guide for all articles?.